My kids are really great at choosing recipes. 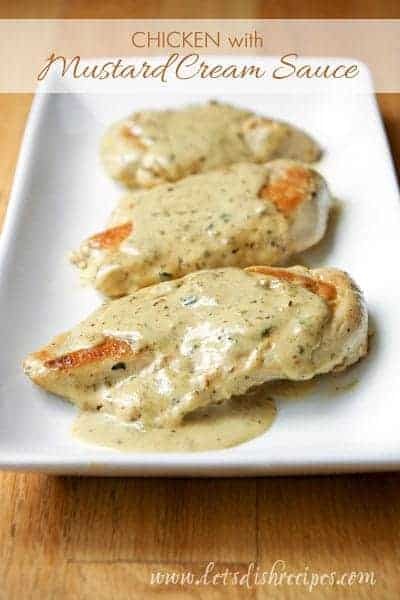 My nine year-old chose this Easy Honey Mustard Chicken for our dinner menu recently and wow, was it ever delicious! And so incredibly easy. Chances are you have most of the ingredients at home right now. Not only was the flavor of the chicken fabulous, it was also tender and juicy. I probably should have made extra, because the entire family wished there was more. Next time I’ll definitely add a few more chicken breasts to the pan, because everyone wanted seconds. 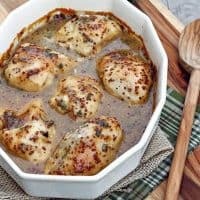 This chicken is wonderful with some rice or pasta to soak up all of the yummy sauce. Add a green salad or some steamed veggies and you have a delicious meal that’s nice enough for company, but simple enough for a busy weeknight. The fresh tarragon really makes the dish, so I recommend using it if at all possible. 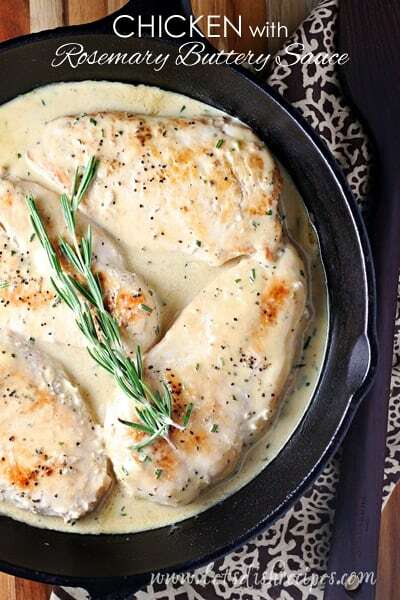 This one will definitely be going into the regular dinner rotation! 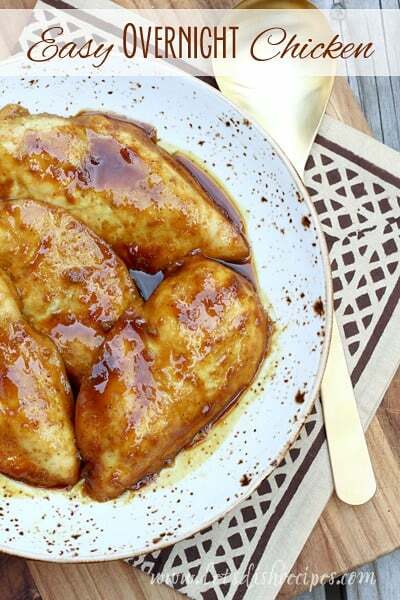 Be sure to save this Easy Honey Mustard Chicken recipe to your favorite Pinterest board for later. Preheat the oven to 350 degrees. Spray a 2-3 quart baking dish with non-stick cooking spray. Combine the grainy mustard, Dijon mustard, honey, soy sauce, tarragon and ginger in a medium bowl. 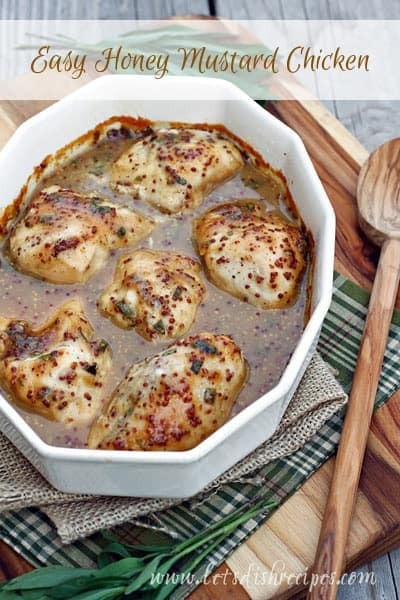 Place the chicken breasts in the prepared pan and pour the honey mustard mixture over top. 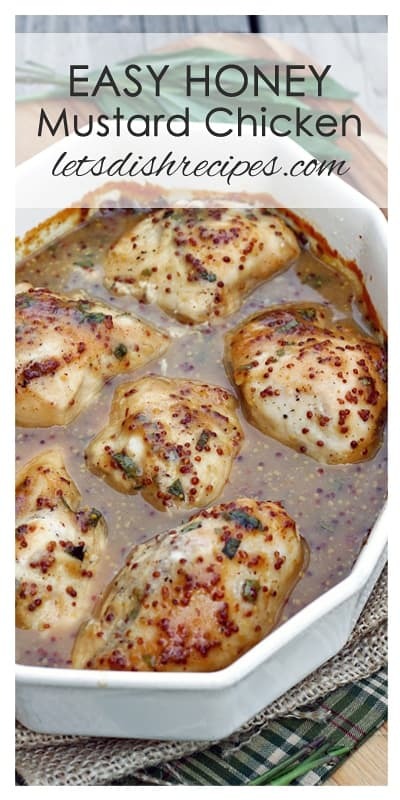 Bake for 40-45 minutes or until the chicken is cooked through and the juices run clear. Spoon pan sauces over the chicken just before serving. Who Dished It Up First: Adapted from Foodie Crush. Looks simple and delicious! Love these kind of meals!! I’ve been holding this recipe in my back pocket since I first read it and I made it today. It was delicious!